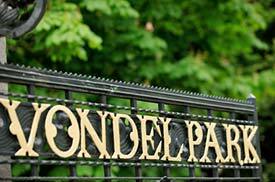 ABOVE: The entrance to Amsterdam's Vondelpark. This 24-room hostel is in the Red Light District. Its 24 rooms vary from twins to private rooms for 6 or 8 adults, and beds in dormitories are also available. The city of Amsterdam has completely renovated its hostel, expanding the capacity to 536 beds. The hostel has dormitories, singles, twins, and larger rooms, all with shower and toilet. Breakfast and bed linen are included in the rates, and you can book ahead on the Web. If you prefer a more central location, try this hostel in a renovated canal house. Like the Vondelpark hostel, it's part of the Stayokay network of 30 Hostelling International affiliates in the Netherlands. Flying Pig has three locations: one near the Central Station and red-light district, one near the Vondelpark and the Leidse Plein nightlife district, and a new "Beach Hostel" in Noordwijk (20 miles/30 km from Amsterdam). Accommodations range from two-person rooms to dormitories. The Shelter City is a seven-minute walk from Centraal Station, while The Shelter Jordan is in a picturesque neighbhorbood near the Leidseplein, Dam Square, and Ann Frank House. The Bulldog low-budget hotel, owned by proprietors of the Bulldog Coffeeshops, has rooms and dormitories. Pets and kids aren't allowed, but "you're welcome to tie them up outside." Beer and food are served downstairs; upstairs, you can get a bed with linens, a locker, and breakfast.